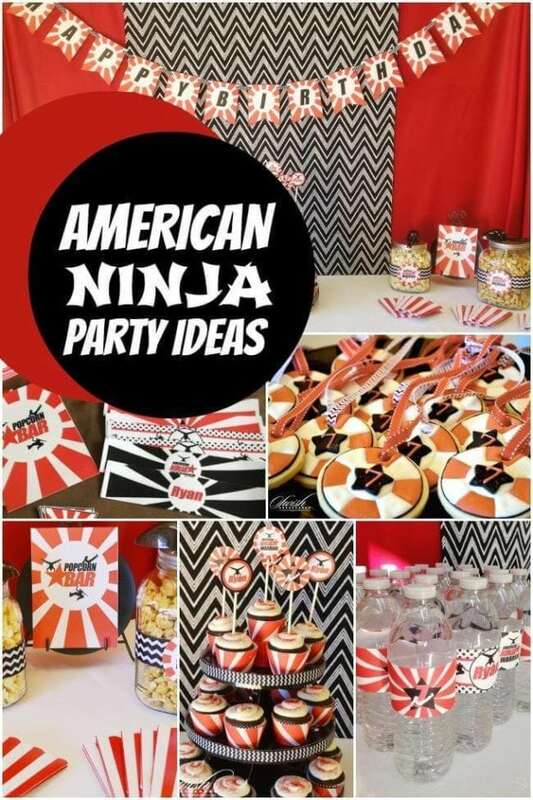 These 17 creative American Ninja Warrior party ideas will help you pull off a kickin’ celebration! If you’ve ever seen the popular television show, American Ninja Warrior, then you know why adults and kids alike are obsessed. The feats of strength and skill competitors accomplish are amazing! You’ll definitely feel inspired to challenge party guests to their own warrior competition with ideas for a backyard obstacle course, including a DIY for the popular Quintuple Steps. Reward party competitors with American Ninja Warrior medal cookies or cake. 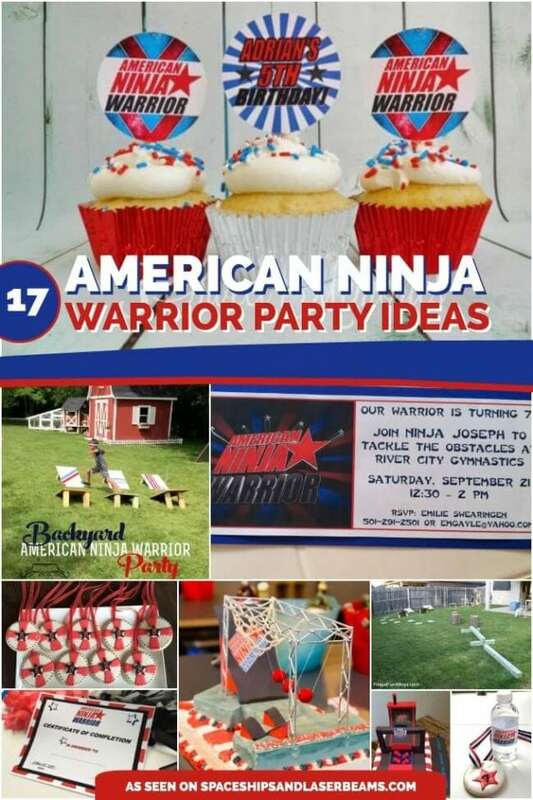 Plus, check out the free printable American Ninja Warrior certificate of completion and the ultimate party supplies. 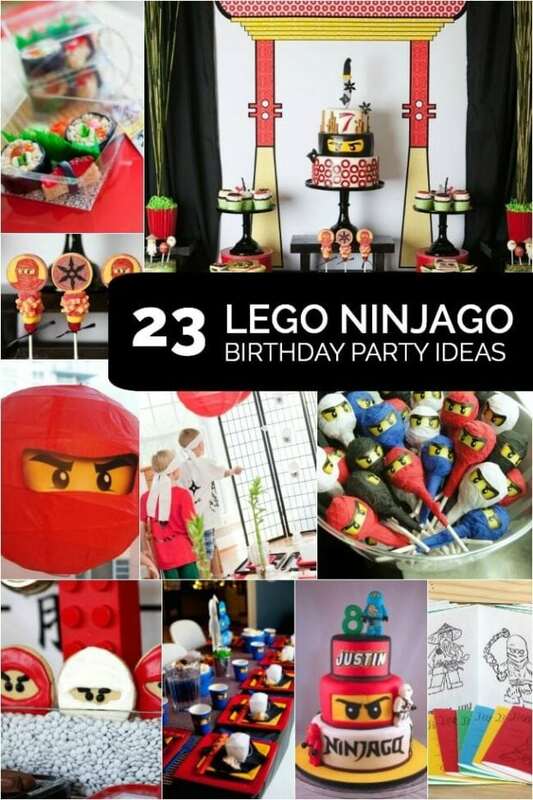 This Lego Ninjago party contains all the fun of Lego building with the fun of Spinjitzu. American Ninja Warrior is all about the insane obstacle courses made to push competing athletes to their limits. This cake decorator brought the wild fun to the bakery making this outstanding obstacle course cake for a little one’s first birthday party! Shaped like the number one and iced to look like water, the tasty cake supports a replica obstacle course that includes the infamous ramp and climbing net. Inspired by the television show where burly men and women face some of the most amazing strength tests as they compete in classic obstacle courses, this innovative party is a kid’s dream come true. You will love the fun printable decorations, perfectly chosen party activities, and stocked dessert table. My favorite elements? Sugar cookies decorated to look like the American Ninja Warrior medals and bold colored cupcake toppers. Turn your backyard or local park into an obstacle course fit for a bunch of ninjas in training. Almost everything in this impressive course is made from items you probably have lying around the house or can easily get at the local dollar store. Competing little ninjas have to make their way through the course, jumping across ninja steps, crawling under pool noodle arcs, balancing on a tightrope, and speeding through webbed rope. 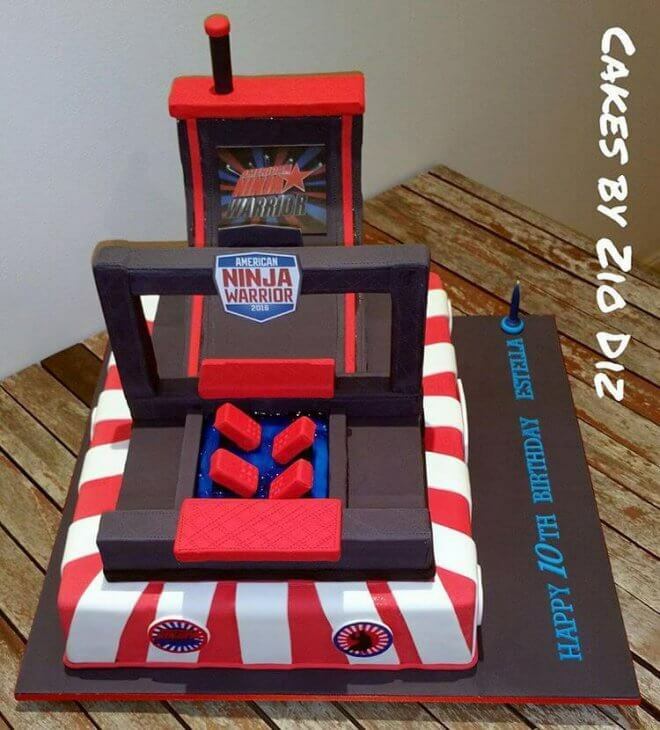 When your son or daughter wants an American Ninja Warrior cake, I say go all out! This amazing fondant cake is decorated to resemble the tough obstacle course that competing ninjas have to face. The edible fondant course is complete with red ninja steps and the warped wall running ramp. The bold colors in this cape really pop and would look great on your party’s dessert table. What better way to recognize little ninja warriors than with American Ninja Warrior inspired medals, made from cookies. Round sugar cookies are iced with bold red and white stripes, with a fondant star in the middle complete with the birthday boy’s age. Red and white dotted ribbons are strung right through the cookie for an edible, wearable treat. 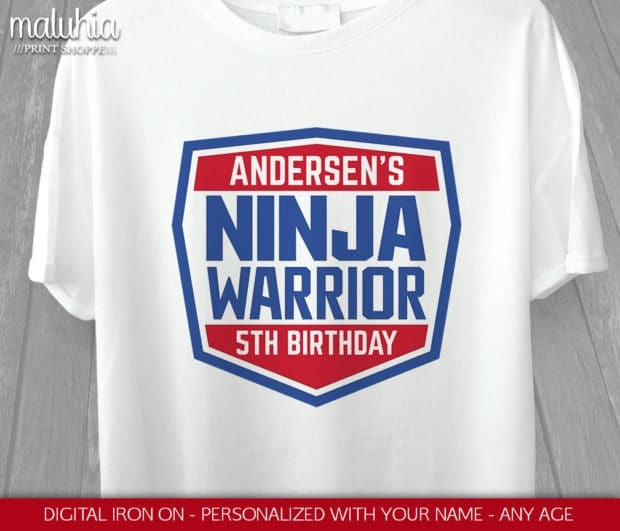 Personalized American Ninja Warrior t-shirts are probably the coolest way to inspire competition among you little ninjas. These digital iron-on graphics can be personalized with the birthday boy’s name and age for a fun decoration that doubles as a keepsake or party favor. Make them yourself for a budget-friendly craft that your child will love for years to come. 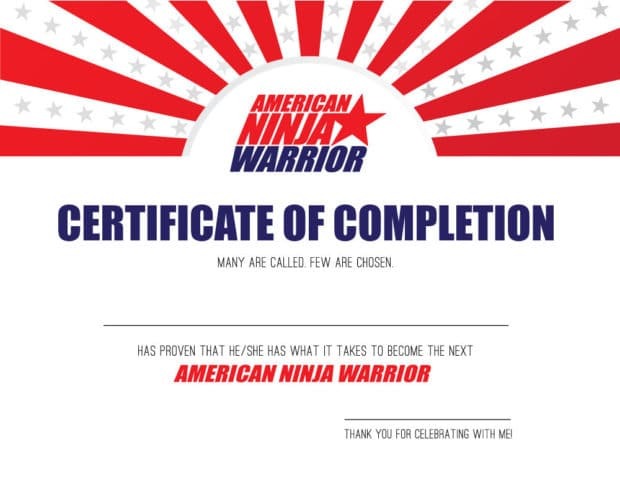 Congratulate your party guests after they complete the ultimate backyard American Ninja Warrior obstacle course with printable certificates. Little ninjas will love having proof that they have what it takes to become the next American Ninja Warrior. These personalized certificates are a fun and inexpensive way to congratulate your party guests and give them a party favor to take home. 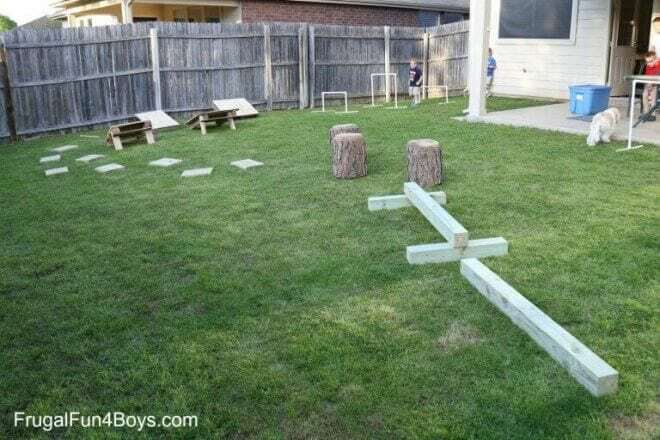 This American Ninja Warrior style backyard obstacle course would be a huge hit with the birthday kid of honor and all of their party guests. 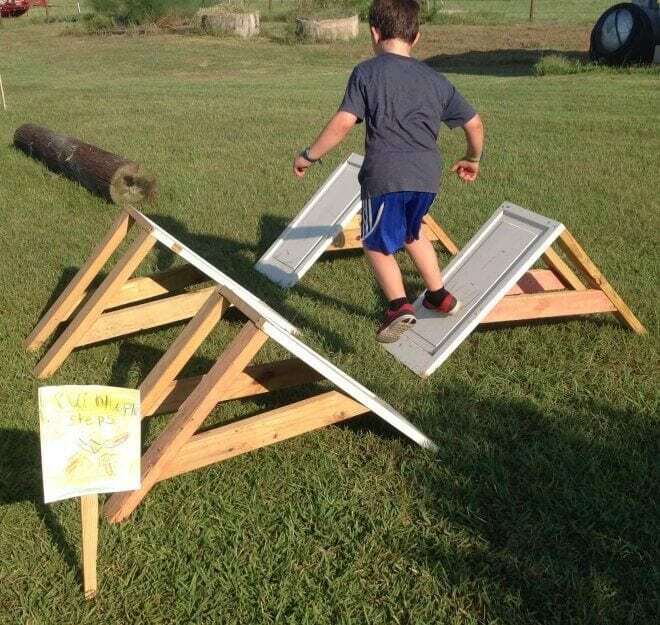 The pieces for the obstacle course are easy to use too, so your kids can set them up however that like then break it down to store in the garage or shed. The obstacles include PVC pipe hurdles, wooden stepping stones, sloped stepping stones, and balance beams. Another awesome obstacle course cake. 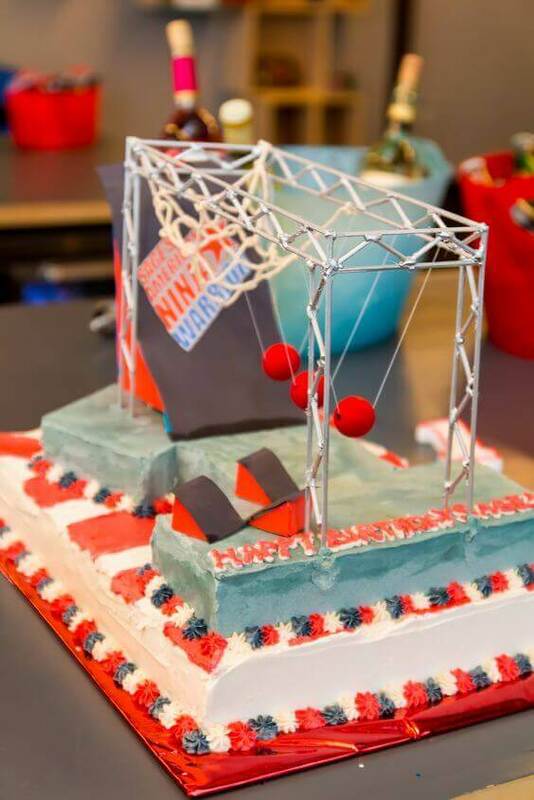 This American Ninja Warrior birthday cake is inspired by the crazy obstacle courses in the show, but would be much easier for the everyday baker to recreate. 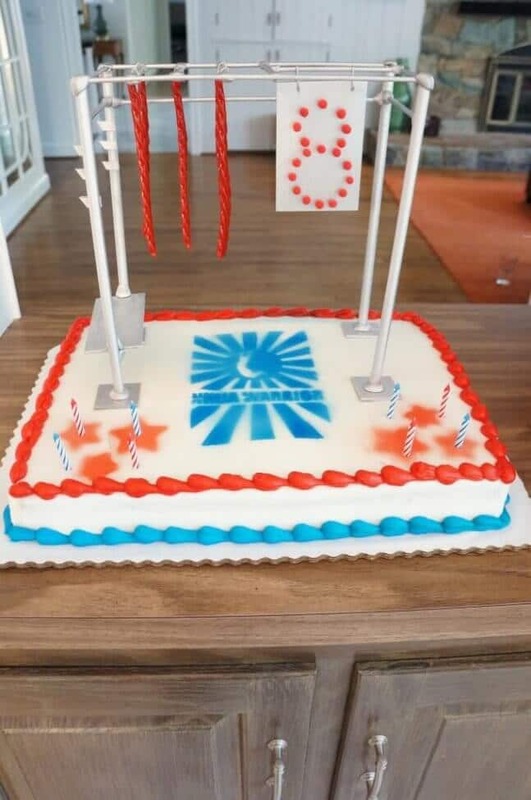 A simple iced cake is airbrushed with the Ninja Warrior logo and topped with a candy filled feat of strength. The only challenge with this cake is having to eat such creativity. Aren’t the licorice ropes a clever addition? Rule number one of being an American Ninja Warrior is to stay hydrated – it’s the key to success. 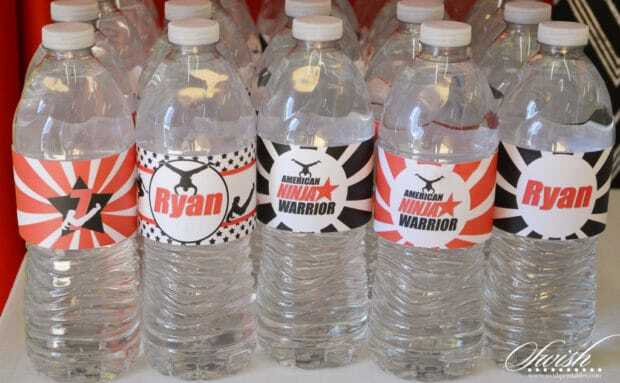 Help your little ninja warriors keep their strength by outfitting plain old plastic water bottles with free, printable, American Ninja Warrior inspired labels. The labels are bright and bold with the most amazing Ninja Warrior graphics. You can also personalize the labels with the birthday kid’s name and age. Invite your child’s friends to the party with these fun ticket-style invitations. Challenge your guests to tackle some birthday obstacles with you while reminding them of the important party details. Another party planning pro-tip is to leave your email address on the invitation for RSVPs. Email is way faster and way more convenient for most parents. Simple cupcakes can be completely transformed with these printable American Ninja Warrior inspired cupcake toppers and cupcake wraps. 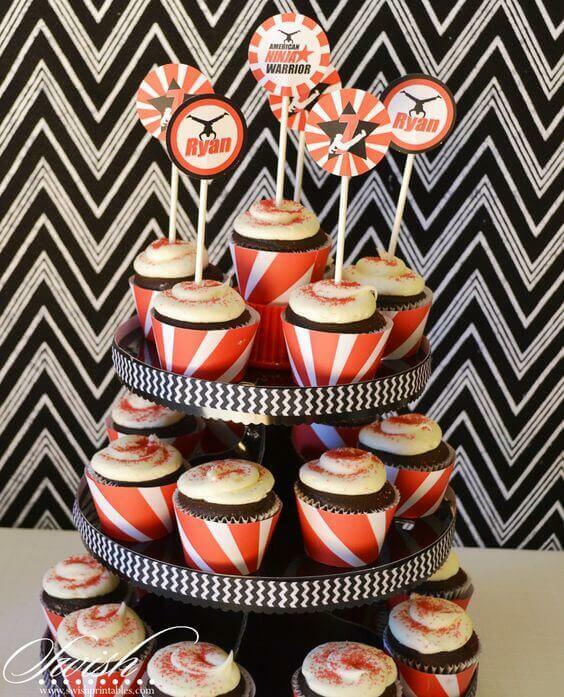 Bold red and white stripes perfectly match the American Ninja Warrior party theme, and the cupcake toppers have the most amazing matching graphics. You can also personalize the cupcake toppers with the birthday boy’s name and age. 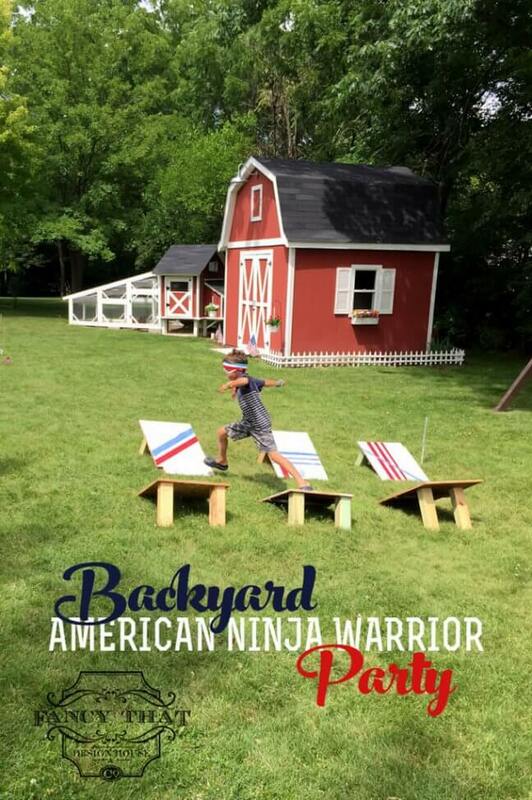 Check out this incredible post to get budget-friendly ideas for your American Ninja Warrior obstacle course. These parents made a thrilling and creative course with items found around the house and little hard work. Quintuple steps (or Quadruple Steps if we are getting technical) were the first obstacle, created using some scrap lumber and old cupboard doors. This inexpensive obstacle is the perfect project for a ninja party. 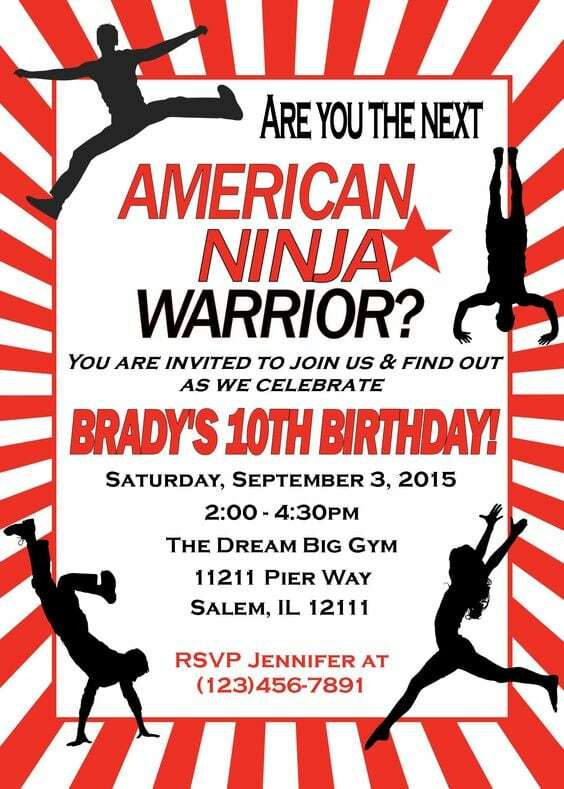 Are you the next American Ninja Warrior? Guests will be excited to discover the answer to that question after receiving one of these perfect-for-a-birthday-party cards. 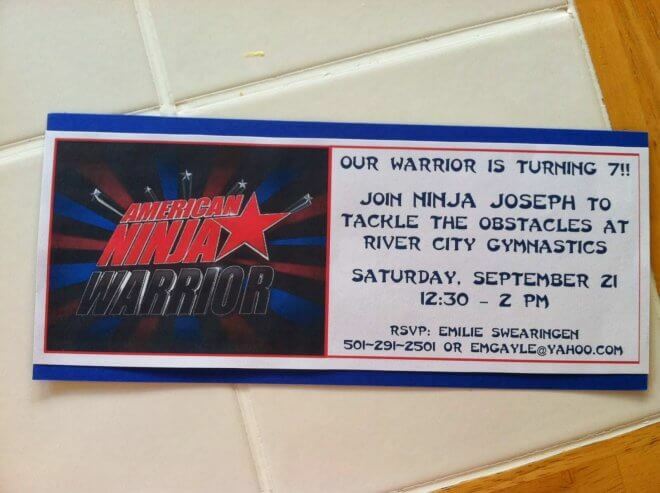 These red, black, and white invitations are the perfect way to invite your guests to you American Ninja Warrior birthday party. The bold graphics and customizable text offer a glimpse into the exciting party to be. Cupcakes are the ultimate dessert option for any party. They are so easy to decorate to match any party theme, and cupcake toppers are one of the easiest ways to do it. 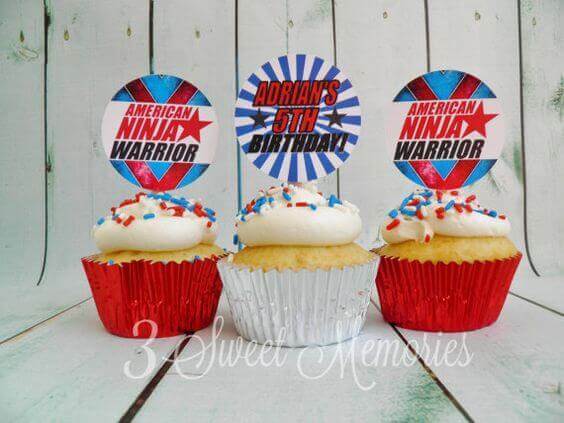 These American Ninja Warrior birthday cupcake toppers can be personalized with the birthday kid’s name and age, as well as a sweet birthday message. Ice your cupcakes with some vanilla buttercream, add some blue and white sprinkles, and you are good to go. 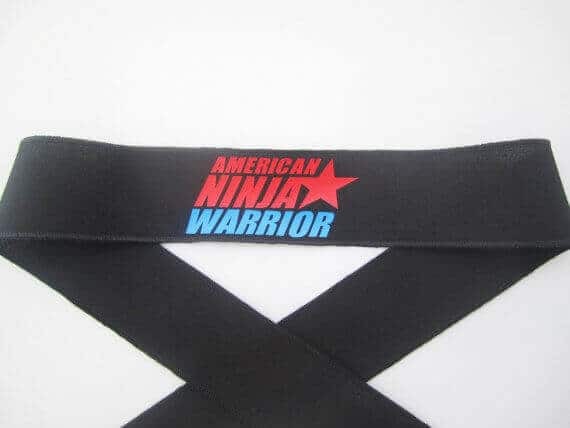 Guests can more easily channel their own American Ninja Warrior with handmade headbands that match the theme. Plus, they make a pretty awesome party favor. Now your American Ninja Warrior wannabe can be the star of their own cake. 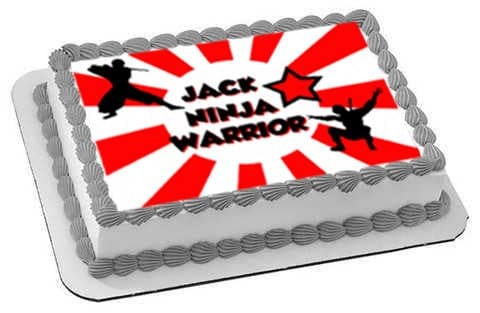 Add an American Ninja Warrior edible photo topper to your child’s birthday cake and challenge your guests to finish their whole piece. Custom order your photo topper so your kid can have their ninja warrior skills showcased right on the dessert.